David Torr went from a trust fund kid who kept getting kicked out of school, to flat broke and waitering, to launching a R100 million turnover business from a garage. It wasn’t the only venture he started. After travelling the world and eventually being cut off from his trust because he wasn’t living up to his father’s posthumous stipulations, David returned to South Africa, lived in his girlfriend’s parents’ house and waited tables to be able to contribute something to his living expenses. But he knew he had potential he wasn’t living up to and that it was time to make some real changes. “An old school friend walked into the restaurant I was working at. We were catching up and he asked what I was up to, assuming I was studying something and waiting tables on the side. Except I wasn’t — that was all I was doing,” says David. “It was a real low point for me. I’d always assumed I had hidden potential, but I was scared to dedicate myself to anything in case it was just a line I fed myself. Realising that everyone I knew was getting on with their lives, becoming CAs and lawyers, was a reality check. David evaluated what he had going for him. In between his travels he had completed a two-year copywriting diploma, but since he was dyslexic, it was a useless qualification, other than the fact that it had added an element of creative design thinking to his skill set. So, that’s what David set out to do. He approached two friends, one a big local DJ and the other ran a bar service business, Carbon Events, and pitched a festival idea, Eden Experience. They were in. With no start-up funds to speak of, they sold tickets before they booked the venue, which gave them enough for a deposit to get started. Eden launched in 2014 and hosts three festivals a year. Importantly, at the end of 2015, the business earned David R120 000, which he invested in UCOOK. The second business is a property development company, Solace. Also launched in 2014, today, Solace has a holding portfolio of R25 million in the student accommodation space and has invested in its first residential development, a R100 million project, Urban Artisan in Woodstock. Pre-sales were at 87% at time of print. The team has also raised a small opportunistic fund to repeat on the deal. UCOOK was David’s first idea though, as well as the most complicated. “I played around with the idea for six months in Thailand. I already knew my trust was cut and that things would be different when I got back to South Africa. “My girlfriend and I were teaching in Thailand, but I’d been introduced to HelloFresh in the UK a few months earlier. I thought meal kits was a really interesting concept. I’ve always been a foodie, and I thought this was a clever way to combat issues associated with cooking: What to cook, how to make it, wastage — all those things. It sounds simple, elegant and smart. And 18 months later it was all of those things. But the actual start-up of UCOOK was in a garage, packing food kits next to a Chrysler in the co-founder’s parents’ house. Chris and David spent six weeks sharing notes until they knew what they wanted to launch. They asked Chris’ parents if they could take a corner of the garage and they each borrowed R25 000, Chris from his parents and David from his stepdad. The first R25 000 bought a vacuum sealer, a hand-held sealer, laminate flooring to keep the environment clean, and a few boards, knives and scales. The rest of the money was earmarked for a website, but they launched on Facebook first. 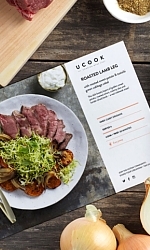 UCOOK’s first 21 orders came from friends and family. The partners managed a turnaround time of one day, and were extremely impressed with how they’d packaged the meal kits. They delivered each kit personally and patted themselves on the back. And then the Facebook queries started coming in — the ingredients looked delicious, but could they recommend a good website for lasagne recipes? The team waited tables to pay the bills and worked on the business when they could. By the end of 2014, they were sending out 50 boxes weekly, totalling R100 000 a month. Before their official ‘launch’ towards the end of 2014, David had also seeded a lot of PR into environments aligned with what they were doing, and it worked — UCOOK got great press. David was able to invest R120 000 which he had earned from Eden, and the team secured some angel investment — and then a VC firm, that had read about UCOOK in the Argus, approached them. David and Chris did a 30-minute presentation that didn’t cover financials, but did unpack UCOOK’s differentiators in the market, their competitive advantage and some of the systematic processes for operations and how the team believed they could deliver on an a la carte selection at scale, instead of category levels. They also covered why they packaged by bag instead of box. It was enough to secure a second meeting — which didn’t go quite as planned. At the end of the evening, David was sharing a bottle of red wine with Silvertree’s MD, and during an impassioned speech about what UCOOK was going to achieve in the market, he spilt red wine on the MD’s shirt. “Our growth is the result of a few different things. First, the capex investment was critical, but we’ve also leveraged our negative operating cycle well. We have great payables with our suppliers. We’re fair when it comes to costing things out and have grown with our community suppliers, but we also pay in 40 to 60 days, while our customers pay us upfront. Entrepreneur is South Africa’s no.1 read business title. Each issue of the magazine delivers relevant, incisive, high-quality content that not only inspires entrepreneurs to achieve their own business success, but delivers a ‘call to action’ as well. Visit our InfoCentre or website.